The 2017 growing season is coming to a close, and we need your help to prepare the garden for winter. We need to harvest any remaining vegetables, pull plants out of the garden, compost them, and prepare the soil for the winter. 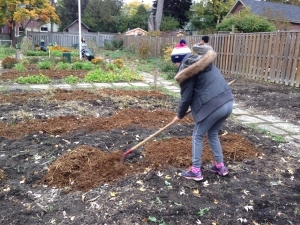 Please join us at Parkview Neighbourhood Garden for our final day of harvesting this year. If you wish, you may bring snacks or a lunch if you want to stay a littler longer. Please dress for the weather, bring gardening gloves if you have them, and wear boots or old shoes. We will supply the gardening tools. We also need your leaves and lawn clippings, if you have them. We’ll use them to make a blanket over the garden, and till into the soil to enrich it. If you have leaves from your lawn at a later date, please consider dropping them off at the pergola at the south end (Parkview Ave.) of the garden. Families are welcome. This is typically a fun day, and a nice way to enjoy the fall weather before winter sets in. Once again this year we will be donating our leftover produce to the Community Share Food Bank, so that nothing goes to waste. We’ll need to harvest all the remaining produce for this worthy organization to pick up. We hope to see all of you on the 28th!